The hibiscus flower brings to mind a lush, tropical paradise and serene Hawaiian beaches, but the healing hibiscus tea, currently all the rage, is in actual fact not your garden-variety hibiscus. Age-old wisdom about this fragrant, tart beverage is finally receiving scientific acknowledgement, proving the rich healing history of this flower to be true. Hibiscus tea is known for its delicious taste, and while it has been enjoyed in numerous different ways in customs across the globe primarily used to treat high blood pressure, it also has many other powerful healing benefits. Dietary changes are an effective way to help manage high blood pressure, and the addition of hibiscus tea to your diet is the age-old way to manage those levels. Although it has already been used for this purpose in traditional medicine, studies have also shown that drinking as little as 2 to 3 cups of tea from the Hibiscus sabdariffa flower each day helps to lower blood pressure levels and works as effectively as some anti-hypertensive prescription medications, without the potential side effects. The dried calyces of the hibiscus flower used to brew the tea are known to contain high levels of antioxidants essential to your body's natural daily detox efforts. They also work to prevent disease and fight low-grade chronic inflammation, which research has linked to cancer, heart disease, diabetes, IBS, Crohn's and so many more chronic diseases and health issues. 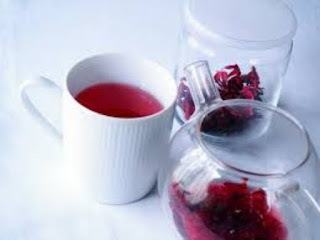 Keeping your intake of antioxidants up is a great way to prevent health issues, and hibiscus tea has the bonus of also containing loads of the well-known antioxidant vitamin C. This makes this delicious beverage supportive for your immune system, iron absorption, lowered risk of chronic disease, protection against that pesky common cold, and much, much more. Not only does fragrant hibiscus brew help to lower high blood pressure which can be a risk for diabetics, it has also been used and researched to improve cholesterol levels. Studies found that regular consumption of herbal hibiscus tea balances your body's good and bad cholesterol and decrease triglycerides. It is also a great tasting, aromatic and vibrantly coloured beverage to replace sodas, fruit juice and other sugar and caffeine filled drinks. In a Taiwanese laboratory study, extract from Hibiscus Sabdariffa was found to be toxic to cancer cells, and especially effective in killing human gastric carcinoma cells, and has also been shown to kill leukaemia cells. Researchers attribute these effects of hibiscus extract to the potent levels of polyphenol compounds, found in hibiscus flowers, also recognized for their disease prevention, antioxidant and anti-aging properties. Hibiscus extract has even shown promise in adding metabolic function which is great news for those with metabolic syndrome or anyone looking to lose weight, particularly if you suffer from obesity. Studies have found after just one month with daily doses an impressive improvement in glucose, cholesterol and triglyceride levels as well as insulin resistance. Even more impressive is the decrease it causes in serum free fatty acids, high levels of which are associated with obesity and uncontrolled diabetes. There is no denying the powerful healing benefits of this incredibly delicious tropical drink, with new studies continually proving the benefits of what the Egyptian Pharaohs enjoyed as a refreshing, healing beverage. As with most potent natural healers, it is not to be enjoyed in large amounts without caution, and should be avoided by pregnant women all together. I wasn't know that it has all that benefits, It's like green apple or dark tea. Yea! Green Apples are okay too, I had written about them before.